AccessoriesSwanson Pill Box [Opakowanie na Tabletki] - 1 szt. Sport Definition ESSENCE Pillbox - 1 szt. Never moving the tablets of your favorite supplement has been so easy and hygienic. It will make your life easier and more enjoyable. If you are looking for a practical solution that is more durable - put on this pill box. Swanson Pill Box [Opakowanie na Tabletki] - 1 szt. Swanson Pill Box - a great, convenient solution for people who do not want to carry around the whole packaging of their favorite supplements in tablets or capsules. Tablet container based on the classic design (5 compartments for tablets / capsules). The product is made of high quality plastic which guarantees durability. A very practical way to transport a number of ready-made portions of your supplements. Swanson is not only a sensational preparations health benefits, but also high quality accessories. Classic design includes 5 chambers of different sizes, which allows you to freely choose the size tablets / capsules to a specific compartment. Thanks to take with you on a trip prepared portions used supplements. 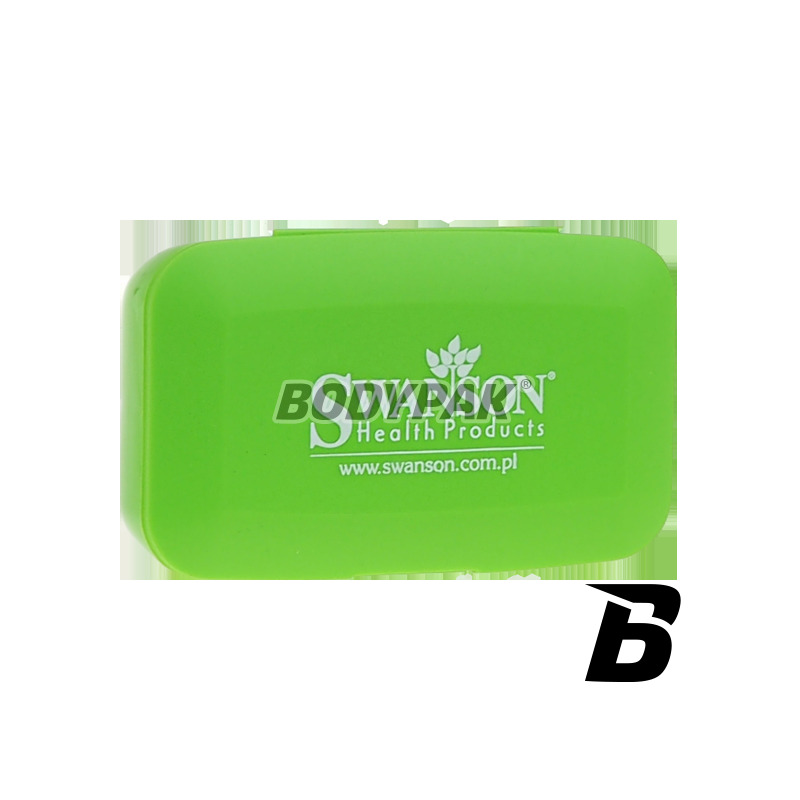 Pill Box present in the original green color and embellishment in the form of the manufacturer's logo on the front. Box for tablets, capsules, is the ideal solution for real builders who have enough carrying additional bags of pills wherever only will commence. SWANSON PILL BOX - COMFORT SUPPLEMENTATION! MEX Pas Fit Brace Violet - 1 szt. Fitness One Gloves Training - Training gloves designed specifically for women, designed for fitness training. Trec Shaker 033 Navy Blue [Winners Never Quit] 700ml - 1 szt. Olimp Rękawice Competition White - 1 kompl. High-quality leather gloves Training in interesting colors! They made with attention to every detail. Very durable thanks to the materials! Extremely durable and comfortable training gloves made of goatskin and bovine. The project is characterized by a high degree of fit male hand, guaranteeing its comfort and a good grip. It provides efficient air circulation! Trec Wristband 067 Opaska Silikonowa POLAND FIRST TO FIGHT - 1 szt.